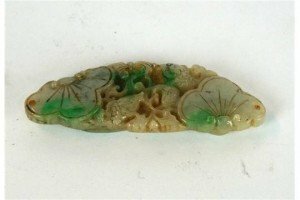 A Chinese apple green jadeite pendant. The pendant carved with the natural tones of the stone, depicting two fish swimming amidst sea foliage. A yellow metal diamond and blue topaz ring, the central oval cut topaz flanked by twin panels of two diamonds in pierced broad mount. 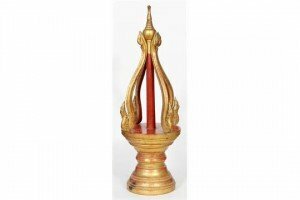 A Thai carved gilt wood temple pedestal, early 20th century The carved and turned socle, rising to a flat circular tier, applied with four naga scrolling members united at the top by a central column, with allover rich red and gilt decoration. 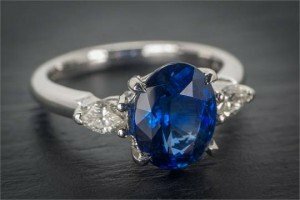 An 18ct white gold, Madagascar sapphire and diamond three stone ring the 2.72 carat oval cut sapphire flanked by marquise style cut diamonds. 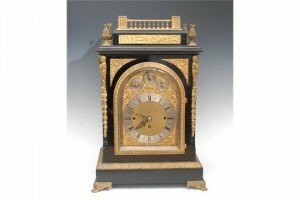 A substantial Victorian ormolu mounted ebonized musical bracket clock, the arched brass dial with silvered chapter ring inscribed with Roman and subsidiary Arabic numerals. 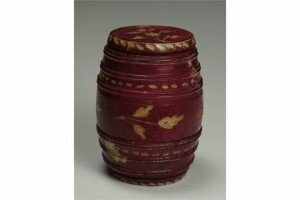 A George III red stained ivory miniature barrel nutmeg grater, with foliate decoration within simple dot and line borders, screw down ends. 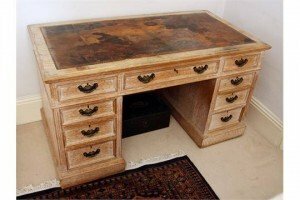 A limed oak double pedestal desk early 20th century, the top with inset gilt tooled brown leather, over three mahogany lined frieze drawers, the pedestals each with three graduated drawers, on plinth bases. 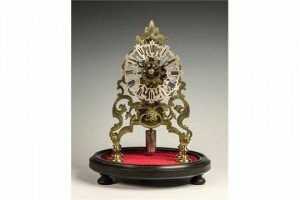 A brass skeleton clock mid-20th century, with pierced skeleton-like silvered Roman dial, single fusee movement with anchor escapement, within a brass structure of arched scroll and floral form, mounted on a turned feet, on an ebonized base with turned feet. 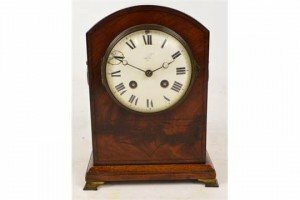 An Edwardian mahogany eight day mantel clock, the white enamel dial set with Roman numerals, with Japy Freres movement, twin ring handles and ebony lined detail, on brass bracket feet. 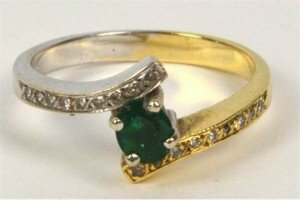 An 18ct two tone gold ring centred with a small oval emerald with diamond chips to the shoulders. 1.3 grams. 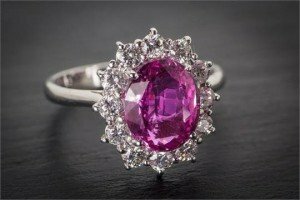 An 18ct white gold, pink sapphire and diamond cluster ring the 2.89 carat oval cut sapphire within a border of twelve round brilliant cut diamonds. 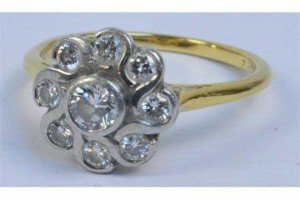 A 9ct yellow gold and platinum floral cluster ring, the raised larger central stone surrounded by eight smaller stones in crossover setting. 5.4 grams. 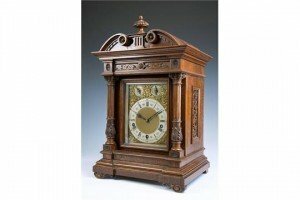 A large Victorian carved oak musical quarter strike bracket clock by Lenzkirch of Germany, the three train eight day movement striking on five coils. 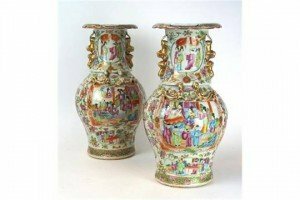 A fine pair of Chinese Canton famille rose vases, Circa 1880-1910 Each of baluster form and terminating at an everted scalloped rim, painted with four blossom panels, the neck applied with relief moulded solid gilt twin shishi handles, with overhanging scalloped neck, the bulbous swollen body painted with corresponding scenes depicting ladies and subordinates before dignitaries, set within an interior and veranda setting, surrounded by borders with painted depictions of precious objects, fruiting branches and Buddhist emblems. 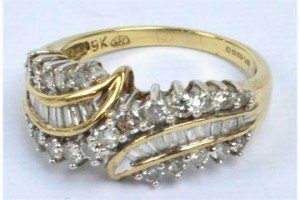 A 9ct yellow gold diamond dress ring with two channel set baguette swathes of diamonds between rows of brilliant cut diamonds. 4.7 grams. 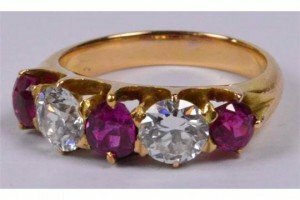 A yellow metal ruby and diamond five stone ring, the central pear shaped ruby flanked by twin diamonds, each weighing approximately 0.60 carats with two further round cut rubies, in pierced claw setting. 6.3 grams. 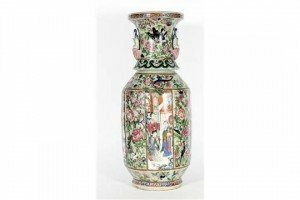 A Chinese celadon-ground Canton famille rose vase, 19th Century Of baluster form, the rounded body with over-hanging ruyi panel border extending to a flared neck with traditional scroll border, adorned with relief moulded Guanyin figures seated on open lotus handles, the body finely and densely painted in typical pink, green and blue enamels, depicting alternating panels of ladies amidst interior and veranda scenes, detailed with precious objects and rockwork, and naturalistic scenes of birds and butterflies perched and in flight before Chrysanthemum, lotus and peony shrubs, all reserved against a light celadon ground. 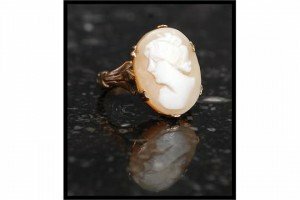 An early 20th century 9ct gold cameo ring. 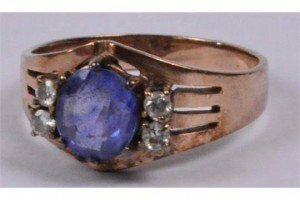 The decorative shank with large cameo having maiden to centre. 3.4 grams. 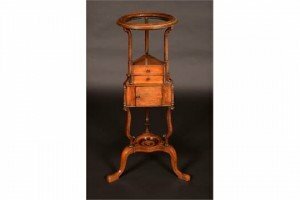 A George II mahogany wig stand, the ring top raised on three uprights connected by two triangular drawers above a cupboard, axehead handles, cabriole legs with pad feet. 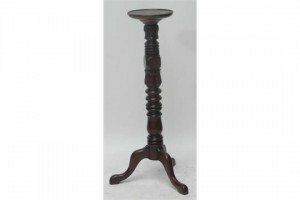 A late Victorian mahogany torchere stand with circular dish top above ring turned main column to three cabriole supports and pad feet.